All Pictures on this Website are from Home Improvement Projects done by O'Leary & Sons. Looking for a new Deck? 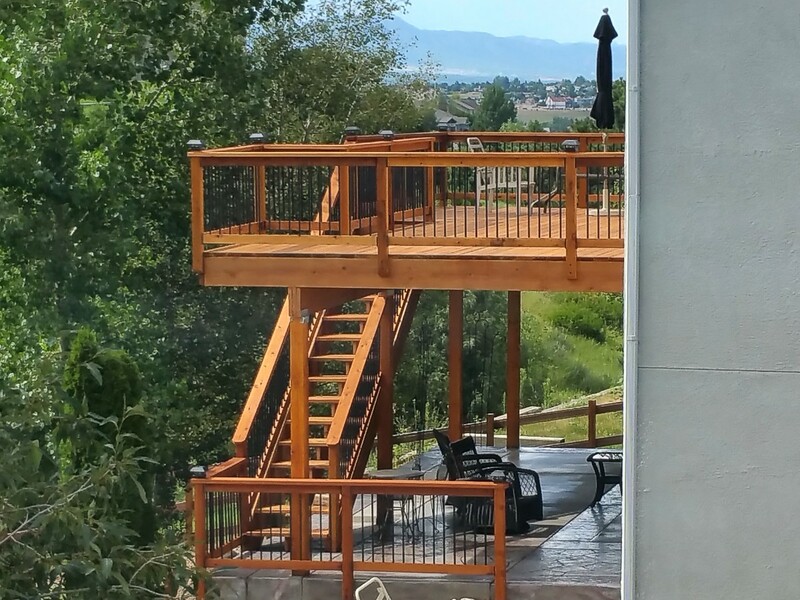 Maybe your deck is not able to be repaired or you just want to build a new beautiful addition to your home. We offer the very best prices in town and guarantee the finest workmanship. One of our specialties is complete deck repair. We are experts in replacing stair stringers, structural supports, joists and repairing loose hand rails. 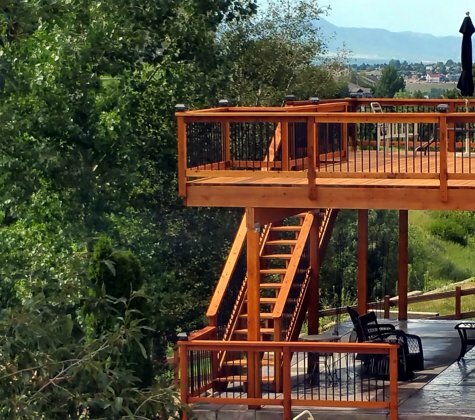 Whatever your deck needs to get it "safe and sound" we can handle. We can turn old decks into beautiful custom looking decks by refinishing the floors, doing any structural repairs and installing custom hand rails, saving you thousands of dollars on having to build a new deck. With the amount of sunshine in Colorado, every porch or garden needs something that provides shade. We build beautiful pergolas and covers that will compliment your deck or porch. Siding and Trim takes on tremendous weathering here in Colorado. We can repair or replace any types of siding or trim suffering from water damage, hail damage, woodpeckers or a leaking gutter. Painting is a very big investment for homeowners and should last for many years. We take time to wash, sand, scrape and spot prime every inch needed on a home, to give you the absolute best result. O'Leary & Sons specializes in maintaining the complete exterior of your home. In business since 1988, we are a small family business that has a proven track record with thousands of satisfied customers in the Colorado Springs area. We specialize in repairing decks and new deck construction. We are experts in adding on to smaller decks, siding repair to professional painting. We offer complete deck refinishing service that includes pressure washing, sanding and staining. With the increase of woodpeckers in our area, we can replace, caulk and paint to make your home look new again. If you need your stucco painted, we use the best elastomeric paints for complete waterproofing and eliminates all future cracking. We also build beautiful gazebo's and sun protection coverings. We are the "one stop shop" for all of your exterior home repair and new construction projects at affordable pricing. Due to the overwhelming number of hail damages that we are asked to do, as well as the extensive amount of work we get with the insurance companies, to make sure that you will get compensated in the best possible way, we are sorry to say that we have to charge you $100 for your hail damage estimate. All other estimates are still free. These guys were efficient, thorough, quick to finish, and the cost was extremely reasonable. I will hire them for any type of carpentry work I have. Excellent results following O'Leary's friendly, professional and courteous service. Our 14-year-old redwood deck looks new again. 30 years in business - Experience! We also offer many services for our commercial clients.